This Imbalance results in postural deviations that include: anterior pelvic tilt, increased lumbar lordosis, lateral lumbar shift, lateral leg rotation, and knee hyperextension. There can also be subsequent joint dysfunction, particularly at the L4-L5 and L5-S1 segments, sacro-iliac joint, and hip joint. Patients may complain of chronic low back pain that is aggravated by extension and relieved by forward flexion. The pain is also aggravated by prolonged standing, wearing high-heeled shoes and activities that hyperextend the spine. There is usually no radiation of pain, although lower crossed syndrome is also associated with piriformis syndrome which may cause pressure on sciatic nerve. The condition may result from repetitive action as may occur in gymnastics and water polo, immobilisation including sitting for prolonged periods or poorly rehabilitated previous injuries. Patients with lower cross syndrome/ hyperlordosis usually describe a dull aching pain that can be localised at the lower back. The pain is aggravated by extension or prolonged standing and relieved by flexion. There is usually no radiation of pain and no neurological symptoms except in case of associated piriformis syndrome where patients may experience sciatic pain. The patient often has difficulty lying supine with legs extended and prefers to lie with knee bent. 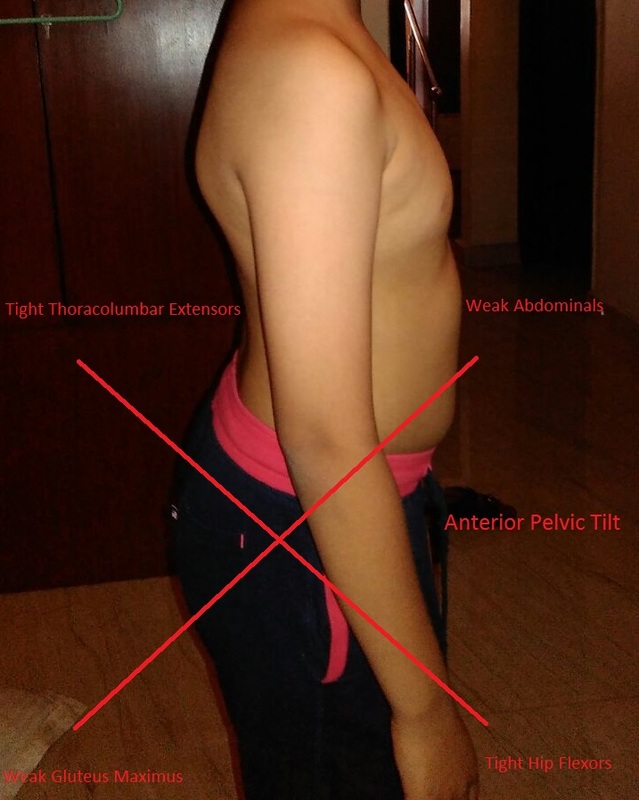 Lumbar hyperlordosis is evident and may be accompanied by compensatory thoracic kyphosis. AROM (active range of motion): lumbar extension increases pain and trunk flexion relieves it. PROM (passive range of motion): usually negative. RROM (resisted range of motion): may be positive for affected muscles. Resisted and length tests may indicate muscle weakness (e.g. abdominal muscles, gluteal muscles) and shortness (e.g. iliopsoas, erector spinae, quadratus lumborum, rectus femoris) respectively. 1. Kemp’s test: The testing procedure is typically described as having a patient perform extension combined with rotation of the spinal region of interest, with a positive test defined as a reproduction of the patient’s pain. Kemp’s Test is a useful examination to differentiate between Lumbar nerve root compression and local lumbar spine sprain/strain. Kemp’s test is a test to assess the lumbar spine facet joints (zygapophyseal joints). It is a provocative test to detect pain , which can be local, referred or radicular. Kemp’s test is usually positive for lower cross syndrome. 2. Thomas Test: The patient sits and the end of the table bringing one of their thighs to their chest and holding while lying back onto the table. With the knee approximated to the chest, the examiner observes the opposite limb. The thigh and knee should be resting flat on the table. Elevation of the thigh or knee with a space between the limb and table indicates a positive test. Normally, the lower limb should have enough hip flexor stretch to allow extension of the thigh so that it lies flat on the table. With hip flexor tightness or in flexion deformity of the hip, the extension is deficient. Test is specifically for the iliopsoas muscle. 3. Forward Bending Test: The patient is seated on the table with their legs extended and knees locked. The feet should be at right angles with no internal or external rotation. The examiner instructs the patient to reach as far as they can towards their toes and hold. The low back should have a natural curve, which should continue into the upper back. The examiner should notice the angle between the table and the sacrum. It should be 70-90 degrees. An angle less than70 indicates tight hamstrings and an angle greater than 90 indicates elongated hamstrings. The muscles we are testing here are the upper back, lower back, hamstrings, and calf muscles. 4. Gluteus Maximus Strength Test: The patient is in the prone position with one knee flexed at 90 degrees. The examiner stabilizes the sacrum, the patient lifts thigh up off the table while the examiner pushes the raised thigh towards the table. This test should be performed bilaterally comparing muscle strength. 5. Psoas Major Strength Test: The patient is supine with one leg elevated and abducted with their foot rotated externally 45 degrees. The examiner stabilizes the opposite ASIS while pushing straight down on the patient’s elevated leg as they resists. This test should be performed bilaterally comparing muscle strength. 6. Schober's test: Assesses the amount of lumbar flexion. In this test a mark is made at the level of the posterior iliac spine on the vertebral column, i.e. approximately at the level of L5. The examiner then places one finger 5cm below this mark and another finger at about 10cm above this mark. The patient is then instructed to touch his toes. If the increase in distance between the two fingers on the patient’s spine is less than 5cm then this is indicative of a limitation of lumbar flexion or over-active erector spinae. Anterior pressure over L3 area often reproduces the pain. Tightness of affected muscles is usually palpable. Lower crossed syndrome is not difficult to identify. However, it is important to identify those patients with the possible presence of spondylolisthesis. Spondylolisthesis patients may experience bilateral sciatica and/or other neurological symptoms. Some also present with a hairy tuft over the lumbosacral area and a palpable step defect. The key to successful treatment is identification and correction of muscle imbalances associated with hyperlordosis. Modalities- Ultrasound 5 minutes (1.5 W.c2 constant) on the gluteus medius and/or TFL, may require laser therapy, 150 joules per point. Thermotherapy may be beneficial. The sacrotuberous ligament also may require attention.